Ad campaign allows you to display several Ads in one Ad location. You can show every Ad in a separate column or show one Ad at a time but with rotation. Group your related Ads in one place and get the best from your Ad location by displaying several Ads (rotationally or at once). It significantly increases your Ad showing performance. Let’s see how we can set it up. Go to Better Ads → Campaigns, here you see a list of existing campaigns and also Add New Campaign button at top of the page, click on it. 2- Write a description for it. It’s just for your guidance and won’t show to website visitors. If you have created banners, now you can add them to a campaign. To do this go to Better Ads → Banners, now edit Ads you want one by one and add them to a campaign. Let’s edit one of them. Select one of the campaigns in Campaign of Ad and click Update. 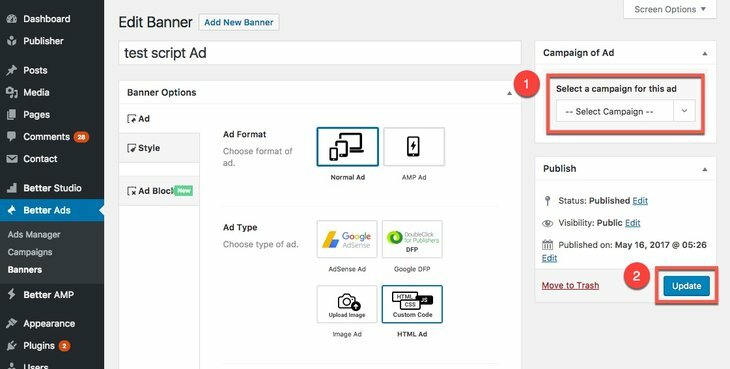 Add as many as Ads you want to one campaign but you can manage how many of them display in every Ad location; wherever you want to use it, you see an option for number of displaying Ads. Find more information about these options in How to Show Ads in Ad Location and How to Show Ads in Widgets.